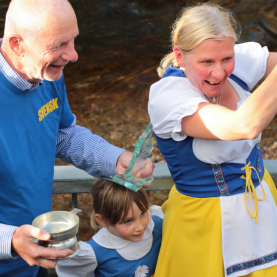 The World Porridge Making Championships (AKA The Golden Spurtle) is a prestigious event for oat-lovers all around the globe. Held once a year in the beautiful Scottish highland village of Carrbridge, the competition is open to professionals and amateur cooks, and celebrates tradition, creativity and passion. This year, for the 25th annual competition, we were delighted that Tam and Joe from the Oatopia team chose to use our expertly milled Coarse Oatmeal as part of their recipe entries in both categories; Traditional Porridge and Speciality. As any true lover of porridge will tell you, all Golden Spurtle recipes are traditionally made with oatmeal, instead of the rolled or jumbo oats which are most commonly used today. This means all entries must be made with coarse, medium or pinhead oatmeal. 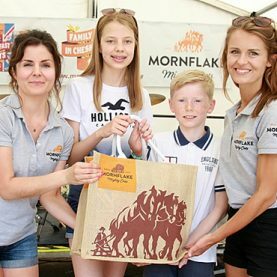 Competition was fierce and after Swedish entrants Calle Myrsell and Per Carlsson claimed the Traditional Porridge championship title for their 3-ingredient traditional recipe, Joe and Tam had their eyes on the Speciality prize. Using Mornflake Coarse Oatmeal and chia seeds, Tam created a chocolatey pudding topped with whisky-infused raspberry compote, but it was Joe’s Asian take on his grandmother’s Scottish oat broth, inspired by his own travels, which secured a finalist spot. It was an honour for our oats to be used in a such wonderful competition, and we loved trying both recipes when they were recreated by Oatopia in The Mill Kitchen, for our video series The Oat Project. One story from the day which truly made us smile was that of 17-year-old Madeleine Harris, who credits her love of porridge to saving her life and helping her overcome anorexia, whilst building a global support network over Instagram. Follow Madeleine @passion4porridge_ for porridge recipes and breakfast inspiration.